In 2008 we crossed the North Sea from the Firth of Forth, then I cruised northwards, above the Arctic Circle to north of the Lofoten Islands. Most, but by no means all of this journey, was sailed solo. Having decided to explore the west coast of Norway a friend asked me how far up I intended to go. Without having bothered to look at a map I replied casually that I’d probably just nip up to the Lofotens. He seemed surprised. So was I when I took a quick look at a chart and saw how far up they were. This is not, as I’m sure you can tell, a tale of conquering the savage seas against all odds. Neither does it claim to be a pilot book or sailing directions. It’s just the story of a holiday in a wee boat that went a bit further than most people manage in a summer cruise. The whole of the landscape of the Atlantic coast of Norway is fantastically scenic, but the further north you go the more stunning it gets and I’ve tried to give a sense of that in this volume. The verdant hills, populous towns and thriving economy of rural Norway, even way up beyond the Arctic Circle, offer lessons for our barren glens and depopulated communities in Scotland. 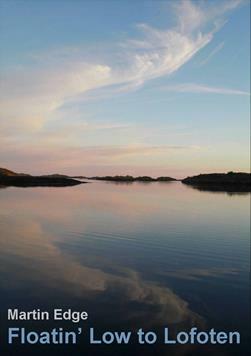 The cover picture was taken from Zoph’s cockpit at anchor in the land of the midnight sun. Go to northern Norway some time if you can, to see how it’s possible to have viable rural economies way further north than Scotland and immerse yourself in one of the world’s most beautiful landscapes. If you are struggling with the grainy black and white photos on Kindle, all the images in ‘Floating Low to Lofoten’ are available on PDF here.